Why did you stop making forms in terms of boxes? At the time, I think the major problem was that it was a boring job. I got to the point where I really hated doing it. That probably has more to do with what I’m doing now than anything else; just the fact of disliking it so much. It’s economics, economics with time. I was spending so much time doing things that are boring, like sanding. It’s not a question of having a good time in your studio, but I don’t want to be that much of a bummer either. If I had to list the things I was doing in my studio for a job opening, I just wouldn’t even think about it. So I stopped making these things in terms of boxes (these are all hollow). I went from that to stippling wood together. I took two-by-fours and glued them together: it was much more direct. Why did you take the polyester off the wood boards? 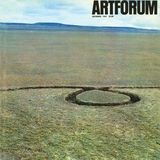 Artforum print subscribers have full access to this article. If you are a subscriber, sign in below. Not registered for artforum.com? Register here. Order the ONLINE EDITION for $5.99. * This rate applies to U.S. domestic subscriptions.